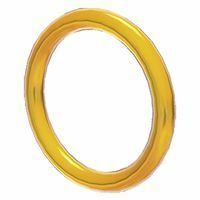 Not to be confused with Gold Ring. Gives the player multiple coins. Coin Rings in the distance in Super Mario 3D Land. Plessie heading towards some Coin Rings in Super Mario 3D World. Coin Rings, or Gold Rings, are ring-shaped objects that first appear in Super Mario 3D Land. They resemble Red Rings but with a yellow color, and they give the player five regular coins when passed through. They are frequently found in underwater courses. Coin Rings also appear in Super Mario 3D World. This time, they give the player three coins instead of five. They are most commonly found in courses involving Plessie. Coin Rings reappear in Super Mario Odyssey, acting as they did in Super Mario 3D World. ↑ Musa, Alexander, and Geson Hatchett (2013). Super Mario 3D World Prima Official Game Guide, page 18. This page was last edited on March 3, 2019, at 20:59.